Hello. 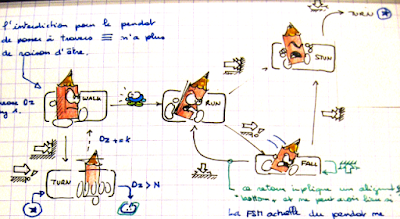 I'm on an adventure with an old character of mine: Bilou, and in a setup we thought about decades ago: the School Zone. By August 2013, I had a nearly complete pixel art set for characters and environment that allowed me to showcase my game engine on a single-level demo where the goal was simply to collect as much letters as you could. Here's what it looked like. 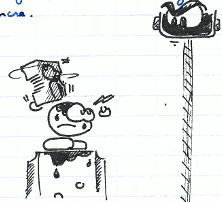 The level design was using a map drawn 20 years ago which I couldn't fully implement by then due to its complexity. Two things happened then. 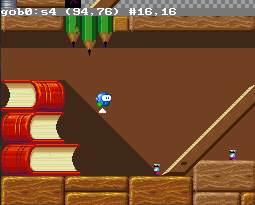 First, I acknowledged that my single level needed some prequel where player could train on the physics of the game in a somewhat safe environment before she would have to face the challenges of the 20-years-old level. Yet I wanted the returning player to be able to focus on the core challenge (level 2) without spending too much time in the training level. if Rayman Jungle Run works well, then Bilou School Rush should be nice too. 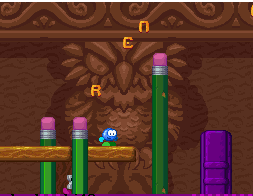 It had essentially two layers of gameplay: the bottom skill layer, where my 4-year-old daughter would agree or disagree with me putting hazards, requesting for additional platforms where pits were too intimidating, and so on, and the above path, where I was taking decisions alone, and where precision jumps are required. As of today, I'd say the game reached 80% and you can already play it that way. I'll use this thread to relate the important development phases, past and future. I made all this during my spare time, so the time elapsed during to steps is not directly related to the time needed for such progress. About one year later, I have a working prototype of raising ink based on sprites and screen masking and a second level. Decision is made to build it as a game completely based on that "training" level. 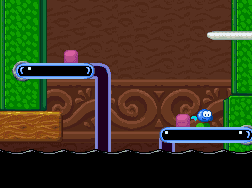 The second level is more or less designed about potential power-ups that are still missing. I had the pleasure of getting direct and detailed feed back from Richard 'Kirby Kid' Terrell, the famous game analyst. I'll have to make sure that all moves preserve momentum and that there are no condition that make the character suddenly lose its speed. My #1 issue at this step is that there is too little interplay between the player and ennemies. I believe for someone who doesn't know all that's possible, there is no real incentive to approach monsters. 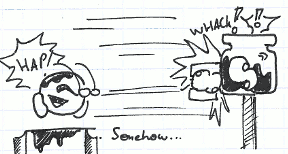 I want to think about a power-up that can support the core gameplay and the rhythm of the speed-driven game. We're about to enter 2015. I am looking for a monster that could chase Bilou and spice up the gameplay: so far, all characters are walking twice slower than Bilou's walk. And now Bilou can walk and run. I'm also trying to offer new ways to use 'pendulum-sponge-bop' once you hook it off its wire. Making it float on ink, or protect Bilou against ink droplet while you hold it. Finally, I'm experimenting with ways to grab dumbladors while running rather than stomping, then landing, then moving backwards, approaching the blador and picking it up. Those moves are completely breaking the flow. Three power-ups were nominated for the game. Floating (defeats Gravity, your #1 ennemy), Punching (defeats monsters when you have no blador to throw) and Wall-kicking. The later got dropped early, because I couldn't really think of situations where it would help the player to Go To The Right in this setup. It would better fit a game where you're doing a lot of climbing. I didn't expect it would take me so long to figure out the right inputs to trigger the new mechanics. I want the game to stay simple in terms of buttons to learn. 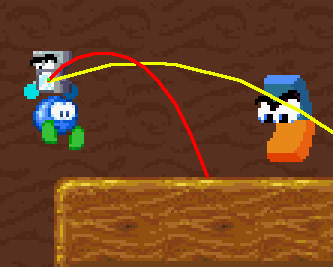 For untrained players, an additional button means needing to look at the controller to figure out where X is. With just A and B, the thumb imho 'remembers' more easily where to go, esp. when it mostly stays at one location and occasionally hop to the next. 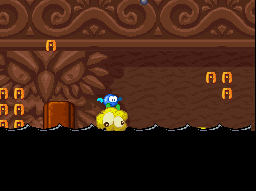 Player will float if she press (L) while falling was terrible. the L trigger on a DS isn't comfortable to press and hold in a run-and-jump game imho. Given that Bilou quickly lose momentum mid-air when the player stop pressing the DPAD, I have to drop that, together with the idea of pressing UP to FLOAT. Player will float if she press (A) a second-time mid-air didn't worked well. 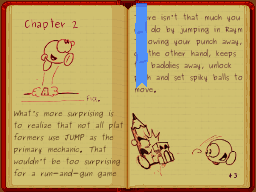 Many times, it triggered FLOAT mechanics when the player actually intended to jump again or to bounce on some bumper, leading to mis-jumps and fatal falls in the ink. same as above, but FLOAT also auto-triggers if player has held (A) for the whole jump. This is direct (just press), modulable (release if you don't intend to float), non-interfering with BOUNCE mechanics. Adopted. Timing the "Big Punch" move needed some fine-tuning. I finally have it as a mix of hand-drawn positioning for the arced part and then some free-moving punch that eventually slows down and come back if nothing was hit. Player will PUNCH if she press (B) when having the right power-up[/b] led to a confusing gameplay. Player had first learnt that B let them GRAB something they stunned. As soon as the player receives the punch power-up, that core mechanic no longer worked, or required a DOWN+B combo. Younger player don't even get it and keep punching bladors they intend to grab until they get accidentally hit by a recovering blador... and lose their punch power. Player will PUNCH if she press (DOWN + B) wasn't working well with the stress of an incoming running pendat. Player will PUNCH if she press (B B) quickly is the best compromise I've found so far. Single B press is still mapped to 'GRAB', double B tap is nervous and requires little additional dexterity or ahead thinking. I also bridged the difficulty gap between level 1 and level 2, taking design elements of level formerly-2-now-3 that proved to require more training and adapting their context, such as giving more ground to allow player to land if she miss a jump or a dodge. 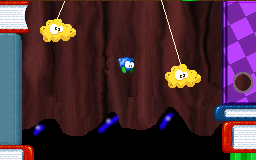 The level also start with a large, hole-free section where one encounters many pendats and bladors to provide the most optimal chances to get some power-up. If you want to have a better idea of how the game plays like. We're now in May 2015. March and April have been globbed in increasing the reliability of the game engine. I can resume working on the game logic. Pendats get a new move: they can be dizzy. They tended to end up stuck in odd places, spinning mad (actually oscillating between "turn left / turn right") since I allowed them to chase the player. 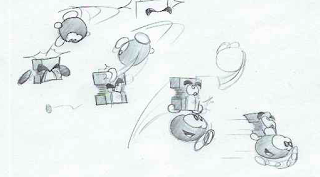 Rather than changing the levels to ensure that no "pendat-hostile" terrain may exist that a pendat could reach while running for the player, the "dizzy" state make them walk weirdly in a fashion where noone would be surprise they no longer obey their prescribed behaviour. a bit later that month, I've got the first beta featuring 4 levels and selectable difficulty level (aka ink raising speed). There'll be a summer break up to mid-august, some time to collect ideas about "closing sequences" and todo-lists of features that still feel odd. That's the time too to experiment alternate THROW moves, but nothing really convincing so far. Thank you. Younger players do definitely enjoy the cartoon look and the reference to school, but I hope I managed to make the game interesting for all audience, especially at "normal" difficulty level when you've got to move on and avoid the raising ink. I've tried to offer multiple paths in every level, with the "top road" being typically more demanding in terms of skill, but also allowing faster and more fluid movement. One time-travelling devlog. The corner stone of the second half of 2015 has been some interaction with power playtester 'Zim'. It lead to significant revision of the THROW and PUNCH mechanics in the game. Beside that, it took me a **long** time to get the game engine properly tested, memory leaks fixed and similar low-level issues solved. That's a drawback of running one's own engine, I know. Because I'm doing that as a pure hobby, I (hopefully?) can afford losing 6 months doing tricky debugging. Hopefully, by March 2016, I get the user interface -- shaped as an interactive book -- sorted out. Then I'll try to adjust idle animations so that the player can see whether he has the PUNCH or the FLOAT power without relying on counting powerup in one's head or checking the bottom screen in the action. And with some sound effects, I finally got The July 2016 release ready to be playtested by professionals as well. Made the gravity a bit stronger for a more reactive gameplay, too. But I think it's worth the effort. Let me be crazy and share my latest build, which jumps straight to the final secret level[/url] for those of you who aren't afraid of facing the final difficulty on demand. (you can still train on any previous build, of course). The quality of your work makes me wonder why I'm even trying to make anything. Amazing work! Taking advice both on pixel art and gameplay is what took me here. Don't even lose motivation by the fact the first screenshot on this post is 20 years old: I can hardly afford doing this more than 1h/day on average these years. At last, I've got score computed, game won and game over screens. Plus 1-UPs. As soon as I'll get the user able to record her name at the end of a game, that will make School Rush "all done". 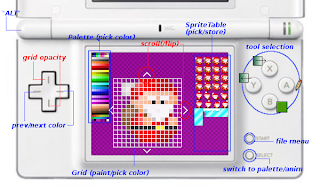 Over the last 10 years, I have been building homebrew tools that allow game making on the Nintendo DS. I have a sprite / tiles editor, a multi-sprites animation tool, a two-layers level editor, a game engine and a upload/download/test/launch editor tool dubbed 'runME'. all open-source in C++. Both my previous game and the current one were made with these tools. But what (imho) is interesting is that changing the games rule, down to any object behaviour, doesn't require tweaking C++ code. Levels and monsters behaviours are defined through simpler script chaining small control rules to define behaviour in one "state" and then giving conditions to switch states. Earlier this year, I started a github fork of the engine focusing on tutorials. So don't be surprised if I use this tool to rant about some aspects of my engine/tools and how they helped making the game above.